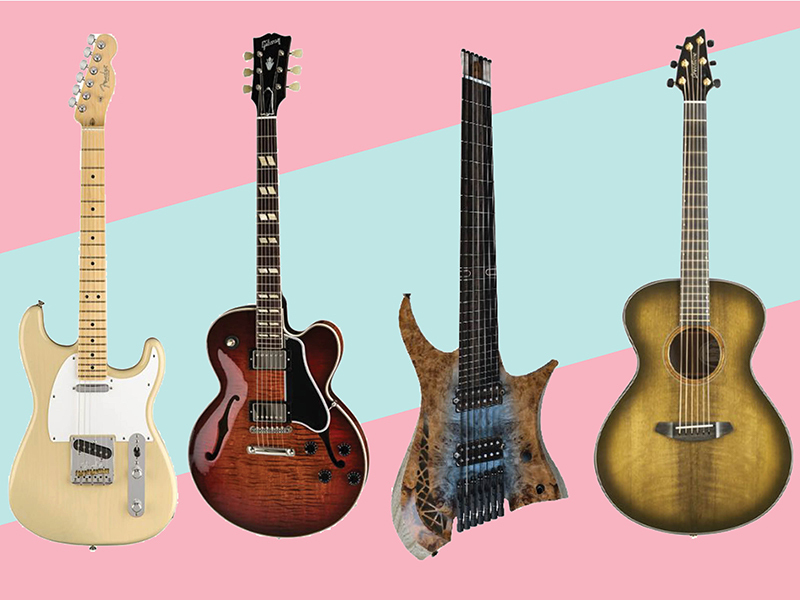 Our favorite new guitar announcements, releases and rumors of the past month. Every month, we’ll compile a few lists of gear that’s fresh out of the oven. Here’s one devoted to electric and acoustic guitars. This single-cutaway beauty is a definite highlight of Gibson’s 2019 hollow-body models. It’s a slim and lightweight take on the iconic jazz box, powered by a pair of MHS II humbuckers and finished with a AAA figured three-ply maple/poplar/maple top. This new spin on the classic is, cosmetic-wise, slightly more conservative. But it makes up for it with several progressive specs, such as a 25.5-inch scale length, 16-inch-radius fretboard and Gibson’s “Advanced Response” neck profile. Only a single P-90 appears on Gibson’s 2019 Les Paul Junior, staying true to the model’s heritage of being a no-nonsense punk and rock ’n’ roll axe. Except for its Strat-style body, this Parallel Universe model is a Tele through and through. The pickup configuration, pickguard and electronics are familiar to Telecasters, and Fender has even wound the two single-coils here to mimic those on the original Nocasters. Designed in collaboration with the Grammy Award-winning musician himself, this signature Les Paul sports three humbuckers: ProBuckers in the neck and bridge positions, and a Ceramic Pro in the middle. This headless guitar is fully customizable: Start with the number of strings you want, then go wild picking the tonewoods, fretboards, scale lengths, electronics and hardware. One of Breedlove’s top-tier models, the Oregon Concert Olive E features myrtlewood from Oregon on its soundboard, back and sides, a hard rock maple neck, and an African ebony bridge. Epiphone has created an affordable take on the top-hatted guitar hero’s signature Gibson Firebird. On the three-piece mahogany body, you’ll find a pair of Seymour Duncan “Slash” open-coil humbuckers that are overwound for more punchiness and a hotter output. This Grand Auditorium-sized model sports a highly figured maple top, mahogany back and sides, and Fishman’s Isys T preamp—not bad at all for a guitar under $300.